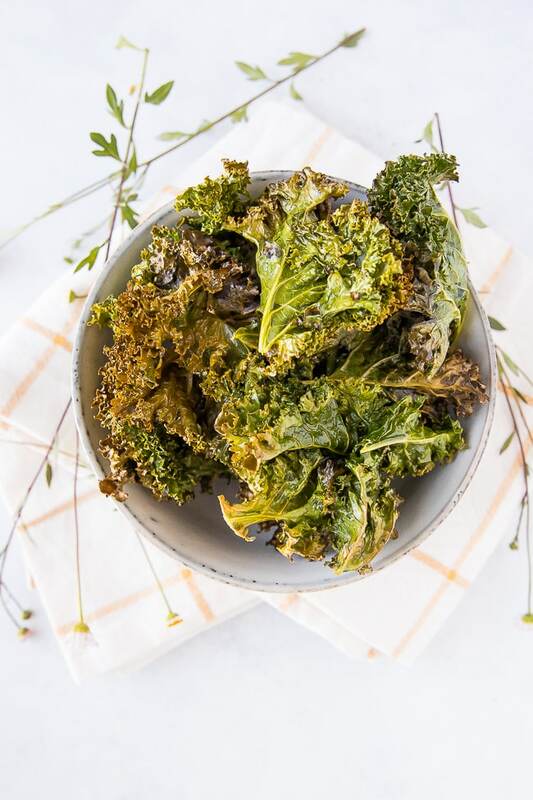 These oven baked kale chips using coconut oil are such an easy side dish or snack. They’re crunchy, healthy, and delicious! Have you ever tried making your own kale chips? I have made them off and on for many years, usually in my food dehydrator. I’ve found that baking them in the oven is my preferred method though, since it’s so quick and easy. I recently bought a bag of kale chips at the store and couldn’t believe that they were nearly $7 a bag! So, I am back to making my own. I can make my own homemade batch for closer to $2.50 a batch, so that’s a huge savings. I think you’re really going to love this easy kale chip recipe. There are three main varieties of kale that I usually see at the store: curly kale, baby kale, and lacinato or dino kale. I only recommend using curly kale for making homemade kale chips. The other varieties really aren’t ideal for various reasons. Curly kale can come in a green or purple variety and you can use either one for kale chips. 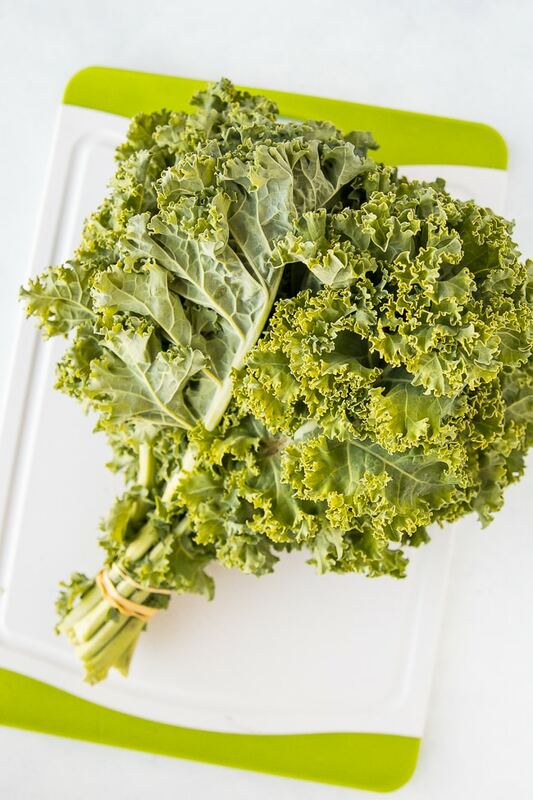 I chose green curly kale for this recipe since that’s what I found at the farmers’ market. You can feel free to get creative with your flavorings. If you want to get fancy, check out this vegan Sour Cream & Onion Kale Chip recipe. It’s so easy to make homemade baked kale chips. Here are the steps. Wash the leaves in a colander. Pour the kale leaves onto a clean dish cloth and pat dry. Place the kale into a large mixing bowl and pour over the coconut oil. Use your hands to coat the kale leaves with the oil. Bake on a lined baking sheet at 350°F for 8 minutes on one side and then 5 additional minutes on the other side. How do you store kale chips? I store them in a tightly sealed container in the refrigerator for up to 5 days after baking. 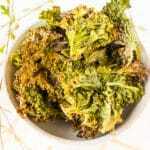 Can I make kale chips in a dehydrator? Yes, but you will need to bake them for up to 12-18 hours to get them crispy. These oven baked kale chips are a healthy snack or side dish made in 15 minutes! Preheat oven to 350°F. Line two baking sheets with parchment paper or aluminum foil for easy clean-up. Use your hands to remove the kale leaves from the stems. Add the leaves to a salad spinner and wash thoroughly. Spin dry. Gently pat the kale dry using paper towels or a clean dish towel. Place them in a bowl and pour over the coconut oil. Use your hands to coat the kale with the oil. 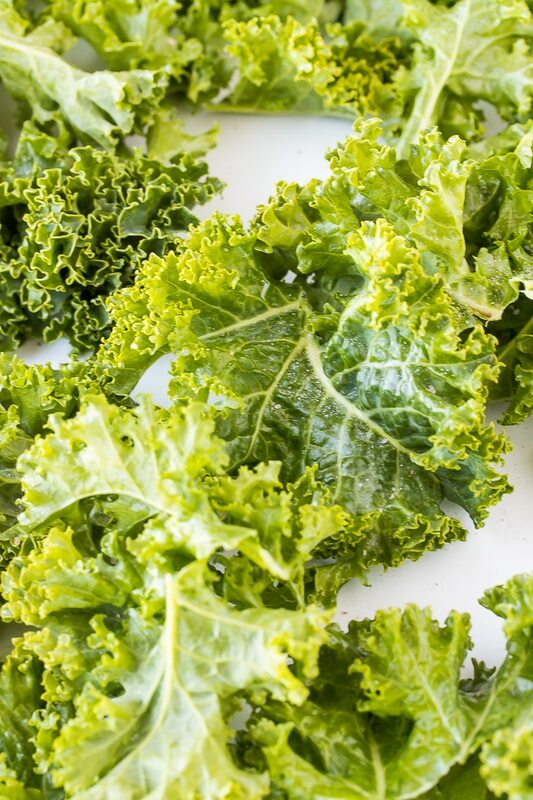 Place the kale leaves on the baking sheets, trying to keep the leaves from overlapping. Sprinkle lightly with the salt. Bake at 350°F for 8 minutes. Flip the kale chips and return them to the oven. Bake for approximately 5 more minutes, or until the leaves start to become brown around the edges. Be careful not to burn. Store any leftovers in a tightly sealed container in the refrigerator for up to 5 days. I am very anxious to try these. Thanks for the idea! Enjoy your springtime weather, and maybe send some sunshine to Nova Scotia?! 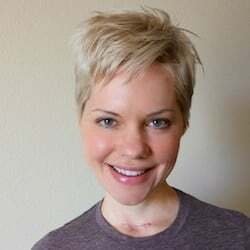 Thanks, Stacie, and yes, sending you some sunshine and warm weather, it’s about time you got some in your part of the world! I love oven baked kale chips! Especially when I am too lazy to whip out my large dehydrator. Personally, I think curly kale makes the best chips! These look delicious! Aren’t kale chips the best?! So easy to make too! I bought packet kale chips the other day and they didn’t taste anywhere near as good as the real deal. Looks like you are getting some gorgeous weather! Great recipe and idea! I’m excited to try this.